I have no intention, this morning, of laying down the law about something! I wish, instead, to raise a question. And to ask you to regard most of what follows as a question. They have got me thinking. By "they" I mean the Hypersuperueberpapalists who seem to me to constitute one of the most problematic heretical groupings currently at work in the Church Militant. The keep on about the Holy Spirit; how He desires us to accept constant surprises; how He speaks to us through the very lips of the Roman Pontiff ... particularly the present one. Kai ta loipa. But, like Edgar Alan Poe's nocturnally silent dog, the Holy Spirit seems absent from places one might expect Him to be. Vatican I tells us that the Holy Spirit does not inspire the Roman Pontiff with new teaching but simply helps him to plug the old stuff. Ecumenical Councils do not routinely suggest that the Spirit is guiding them in their new articulations of doctrine. Anti-Gnostic polemicists such as Irenaeus find guarantees of pure Teaching in the historical succession of orthodox bishops from the time of the Apostles, not in the activity of the Spirit. Pius popes defining Marian doctrines do not claim the inspiration of the Spirit. The "Nicene" Creed refrains from claiming the Holy Spirit as the church's guide; locutus est per prophetas (contra Marcionem) is the role it appears to highlight (I know of no credal document which offers loquitur in Ecclesia). Yet that Symbolum Fidei was promulgated by Fathers who had everything to gain from claiming the Holy Spirit as witness to their own very decisive doctrinal interventions. And if, while on holiday near Pepuza, we find groups getting excited about the Spirit, we are inclined to be very cautious about their orthodoxy. In S John's Gospel, the Lord says, indeed, that the Holy Spirit will lead his disciples into all truth: but I discern no evidence that this refers to anything beyond the ambit of the Gospel Narratives themselves. When the Council of Jerusalem writes edoxen gar toi Pneumati toi Hagioi kai hemin, they are surely not so much claiming the inevitable concurrence of the Spirit with their own conciliar decision-making as referring to the Outpourings of the Spirit as narrated in the earlier chapters of Acts. So; I have offered you something of a clearing of the ground done from what you might loosely call an apophatic stance. Now we come on to the more positive exploration: what is the ecclesiological role of the Holy Spirit? Over to you. Cardinal Sarah deals with this in paras 211 to 215 of 'La Force du Silence': 'The Holy Spirit is without a face and without words. The Holy Spirit works in silence from all eternity....the Holy Spirit has no opinions. He just repeats what Christ has taught us in order to lead us to the complete truth....During conclaves the Spirit indicates to the Cardinals the choice of God; they must submit to his will and not to human political strategies". I wonder whether he was thinking of the St Gallen group! As a mere observer with no theological background I see here much in common with "discernment" which seems to lead, not infrequently, to the conclusion you wanted. If you add a few extra syllables including ultramontagne to this and you get a song from Mary Poppins? I wonder, Father, did you perhaps mean Mr Holmes' silent hound? Now, John, that really is inspirational! I don't have a comment on the merits, but I believe that dog is Sir Arthur Conan Doyle's. Supernatural Obedience to Christ in the life of the believer through faith is the sign of the Holy Spirit, manifesting in his visible fruits. The supernatural source of this Obedience of Faith is the power of the Holy Spirit working through the Sacraments of the Church especially the Holy Eucharist in which we become one in will with God, theosis, through membership in the very Body of Christ. When a heretic denies that a believer truly becomes holy in this way by the manifest power of the Holy Spirit, but rather claims that we are stuck always sinning or God the Father is a Pharisee in his rules and Jesus fixes these harsh expectations such that the Father no longer requires holiness of the believer, he commits the sin of blaspheming the Holy Spirit, denying the very purpose of supernatural grace, and is stuck in a box of materialism, Arianism, modernism etc., of which God is considered powerless in this world, meaning there is no Christian victory *now*. They accept a shallow understanding of Christ, desire blessing without crucifixion, are worldly with a religious costume. Would that not be Arthur Conan Doyle's Quietist canine? I regard these appeals to the Spirit as examples of reading modern gnostic ideologies (by which I primarily refer to Hegel and his successors) back into Christian thought. This 'reading-back-into' is typical of the entire ressourcement rallying cry of the Nouvelle Théologie, which largely consisted of reading modern versions of Neoplatonism back into the Patristic sources. Connecting such appeals to the Spirit to the early Church are examples of the well known mythic phenomenon of the 'prestige of origins' (cf., Mircea Eliade's writings, to which, fwiw, both JP2 and B16 refer). Of course, this relates as well to the would be Reformers of past centuries, who regularly appealed to their versions of the early Church to justify their imposition of 'reforms.' Those were less optimistic times, and there was less overt faith in the Religion of Man. Nowadays, the appeal to the 'prestige of origins' represents more of a tactical feint, to give the substance a veneer of reassuring continuity, while the appeal to the Spirit is more overtly an appeal to the Spirit of the Age than was possible in past centuries. The true spirit of these modernist movements can be seen in the constant refrain about being 'on the side of history' or, if recalcitrant, on 'the wrong side of history.' The Spirit can be seen to have much in common with both the Hegelian World-Spirit and with the Heideggerean Being/Dasein that comes to us from the future. Thus, faith becomes a sort of surfing on the wave of the future, a search to be the first to embrace the next greatest wave of history, which is itself the Spirit unfolding itself in the world. And if you don't believe me, believe Teilhard de Chardin, the prophet of this new faith. I can't believe Fr. Hunwicke mixed up Edgar Allan Poe with Arthur Conan Doyle. But after all, Hesiod nods. Hegel reportedly stated that 'Only one man ever understood me, and he understood me wrong'. So I presume that the Spirit Spin of Team Bergoglio means that the Holy Spirit will teach us everything that we have 'understood wrong'about Pope Francis. Right? Thanks. I'm currently rereading the Complete Sherlock Holmes (man doesn't live by the latest mantic rantings of the Spirit alone, at least not by those emanating from Rome these days) and Father had me wondering whether age is catching up to me. CCC 154 Believing is only possible by the grace and interior helps of the Holy Spirit. I guess it is the catalyst that raises bread or the oil that permits a bicycle to operate. Might I suggest a work by Henry Edward Cardinal Manning: "The Temporal Mission of the Holy Ghost: or, Reason and Revelation". The good Cardinal was certainly an ultramontane; I think, however, that he was not so intransigent as some have made him out to be. In any case, one might still read his works with profit, even if one does not agree with him on every point. Your penultimate paragraph, with its challenging "surely," makes me hesitate to question what you so positively assert. However, the question you raise so very clearly, is certainly both timely and in need of reverent exploration. I know nothing at all that is worth offering in answer, but think it very significant that the fundamental question of the Holy Spirit is, at least formally, the point of disagreement between the Roman and the Orthodox Churches. The latter do not readily accept the Pope as the ex officio mouthpiece of the Holy Spirit. The Holy Spirit speaks whene'er the pope chats up a journalist. I "no-platform" Israelis, but applaud the "peaceful" Islamist. "The latter do not readily accept the Pope as the ex officio mouthpiece of the Holy Spirit." Nor should Catholics. There is nothing in the Vatican I defined dogmas to support the notion of "the Pope as oracle." The ecclesiological role of The Holy Ghost is to represent Jesus Christ in the One True Holy Roman Catholic and Apostolic Church the way that Jesus Christ represented God the Father in everything from the Incarnation to The Ascension. The Holy Ghost brings all truth to the Church, He sanctifies, and it is He who is the source of the plenitude and differentiated graces limned in the Holy Gospels. He is the Sanctifier and it is He who strengthens us and, as we can so vividly and starkly see, He can be resisted even as God the Father and God the Son have been resisted since shortly after the glorious creation. What He absolutely is not is an innovator or the source of spiritual or doctrinal novelty and He would never roam the peripheries outside of His bailiwick which is circumscribed by the Original Deposit of Faith, for peripheries have always existed within that bailiwick. I have often been struck by the presence in the 1662 rites for Baptism that the prayer for the gift of the Spirit is connected with the Church. In the Publick Baptism of Infants, the prayer comes after the Exhortation that follows the Gospel and connects the gift of the Spirit with regeneration: "Give thy Holy Spirit to this infant, that he may be born again, and be made an heir of everlasting salvation." But in the Reception service that follows Private Baptism, there is still a prayer for the Spirit: "Give thy Holy Spirit to this infant, that he being born again, and being made an heir of everlasting salvation, through our Lord Jesus Christ, may continue thy servant, and attain thy promise." The old Prayer Book commentator Charles Wheatly (A Rational Illustration of the Book of Common Prayer, 1710; ed. Corrie 1858, p. 441) suggests that the Reception service is principally to provide Godparents for the child who has been privately baptized without them. And we might see the prayer for the gift of the Spirit, which is sought for the child's continuance as God's servant, as connected to the sponsors' duties to bring the child up to carry out the promises they have made on its behalf. Then, in the rite for the Baptism of Such as are of Riper Years, there are two requests for the gift of the Spirit. The first is before the water baptism (for regeneration, as in Publick Baptism of Infants). The second follows the water baptism (for continuance). I find it interesting that in this rite the Candidate answers the interrogations for himself, but the Priest asks the Godparents for the candidate's name. The second prayer for the Spirit, therefore, has likewise a communal, ecclesial character: it is to do with the Church's support of the baptized person in living the life of a Christian. So here we discern two actions of the spirit: one operating on the individual (regeneration), and one operating within the corporate Church (continuance). Confirmation, of course, is a further question. I recently made the acquaintance of Dr. Richard J. Bernier, whose 2014 McGill dissertation was entitled "The sacrament of Confirmation in Roman Catholic tradition: a history of interpretations and a proposal for integration." In conversation (if I recall aright), he summarized his thesis as an argument that the apostles had made Confirmation part of the rite of Baptism, because they themselves experienced their initiation into Christ in two stages: his earthly ministry, and the gift of the Spirit at Pentecost. 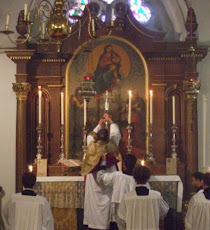 But he felt that both stages were best expressed within a single liturgy. "On the day of Pentecost they felt and knew that they were a society. They had the sympathies of a united body. They had not formed themselves into one; He had formed them into one. They had not devised an organization for themselves; He had framed it. The united society did not choose the apostles into a certain position; they held that position already. Around them the new baptized formed themselves. ... [W]hile [the apostles'] number represented the twelve tribes of Israel, they were indeed the appointed messengers to all the families of the earth." I think the Prayer Book, as I've read it above, while making something else of Confirmation, expresses something of this two-stage experience of the Spirit in baptism: both in regeneration, and in "being made a society." By the way, Father. I appreciated your explanation of Acts 15:28. I wonder what we are to make of Acts 16:6. Much is said today about the Spirit permitting. But forbidding? Thanks Cherub and Jesse. Humour is a way that we can maintain a degree of sanity in these strange times. I do like Jesse's G&S verse, and I see that Bruvver Eccles is in a similar vein today with his 'Old man Francis, he don't say nothing, he must know something'. Hmmm. The last time I tried to make a comment it never got to the public forum - possibly because it was too censorious and recaclitrant - or simply because it was just too long, like this one! Still, censored as it probably rightly was, I'm guessing you read it Father, and set it to one side for public consumption so I'm hoping that minimum will still pertain this time around. These comments of yours on the Holy Spirit I am tempted to put them in tandem with your comments about the 'invention' of the role of the Holy Spirit in the epiclesis of the Mass by the Greek Fathers - and only after the establishment of the Roman Canon - which brought you to reflect at that juncture, too, what exactly does the Holy Spirit DO in the Mass. And here you are again wondering what the Holy Spirit is doing in the life of the Church's concrete institutional actions. Am I seeing a pneumatalogical minimalistic tendency here? Has Knox's excellent Enthusiasm and an English wariness of the extremes it engenders actually morphed into something more theologically scrutinisable. In other words might I not ask you for clarification: What do YOU think the Holy Spirit is FOR in the Economy? (And, whilst I'm at it in the Theology also?) Are you a Monarchist (which would be very Greek of you, ironically)? Or do you take a more Latin approach to the Trinitarian Relations? The Spirit blows where He wills - we can't appropriate Him and instrumentalise Him as a means to validate what are in fact merely our own very human deliberations and decisions. (This is me agreeing with you.) Nevertheless, the idea that the Holy Spirit, like Christ, isn't at work in the life of the hierarchical Church giving His particular charisms to those who either co-operate or fail to co-operate fully (just as He is at work in the Sacraments and particular graces for the sanctification of the individuals and the building up of the whole body according to the needs of the Church Militant) seems to me a somewhat exclusionary approach to the hierarchical Church. And just as God's agency in the physical or ontological goodness of a concrete action is always present - even the ‘being’ or ‘existence’ of an action inhabited by an evil intention that God is NOT at work in - so too the Holy Spirit is at work in the Body of the Church qua hierarchy - even when the very worst of the prelates are doing their literal damndest to lead the Church astray. This obviously does not mean that we canonise every word from a garrulous Pope nor sit by in silence at the actions of mendacious prelates - even should they claim 'inspiration from the Holy Spirit'. But once quasi-physical continuity (pace Irenaeus on the hierarchical succession and Vincent of Lerins on doctrinal development) can be established then, just as body and soul are hylomorphically united in one substantial reality, so too we can say: this teaching, in continuity with the Tradition and Deposit of the Faith comes from the Holy Spirit. The body is the same - this comes from the same branch. Thus the Holy Spirit is the guarantor of its truth - speaking through the successors of the Apostles validly and licitly ordained - in continuity with the Faith since the beginning. If we DON’T say this, Father, then we have no grounds not to doubt everything - including the Assumption and the Immaculate Conception of course…. I've been reading this blog quite consistently for many years now. I don’t ever recall our blog host to ever consider or call the epiklesis in eastern rites to be an invention. Younger than the roman canon for sure, but an invention? For shame that you should say he did! @Stephen I don't want to get in to an unseemly spat over this. But 'for shame that you should say he did!' requires some come back I think. "In the Eastern rites, and in the invented Eucharistic Prayers which were introduced into both Roman Catholic and Anglican worship in the 1970s and 1980s, the Epiclesis is treated as crucially important. The Holy Spirit is invoked to come and make the elements the Body and Blood of Christ. I am not a Byzantine and I have no interest in rubbishing their ancient and noble tradition. Nor would I stand for any 'latinising' of their tradition. The only criticism I have is of those Byzantines who encourage an Orthodox 'Western Rite' in which an epiclesis has been intruded into the Roman Canon. Because the epiclesis is not our tradition. And our tradition should not be Byzantinised." "We see the Oriental epiclesis as a comparatively late fad in the evolving liturgical tradition." 22nd September 2010. I don't in the least apologise for using the word 'invention' to refer to Anglican and Bugnini Prayers. But I wish now that I had used the word 'fashion' rather than 'fad'! Still ... as previously ... it was not and is not my intention to sneer at the venerable traditions of the East. Since Papa Bergoglio took to using whatever Italian word his translators render into English by 'fad', I have been more circumspect with that word! This discussion is now over!!!!!!! S Markos Eugenikos ... a political canonisation?